I‘m not sure when anger with God became a great idea. I understand that I’m mad at God is not a new phenomenon. Nonbelievers have long indicted God for a variety of alleged shortcomings. These clichéd harangues usually start with: “How could a loving God…” you fill in the rest. And I am aware that the Bible has numerous examples of people feeling a heavenward fury for various reasons. Beginning with Cain’s murderous brooding through Job, Jonah and King David; people are sometimes mad at God in the Scriptures. Still, even in these well-known biblical examples, I am hard pressed to find any evidence that fist shaking at God is helpful and constructive. You can check me on this but I’m not finding a ringing endorsement for these expressions in the biblical record. I have heard pastors and counselors encourage grieving people to tell the Lord how they feel because “He can take it.” While it is true that God is not intimidated or manipulated by our displeasure with Him, I’m just not sure what my self-righteous indignation accomplishes. On the surface, expressing anger at God seems to imply relational closeness. After all, if I invest emotional energy in an interaction, I minimally have to believe in the object of my outburst. This is why self-confessed atheists’ rants against God’s character are so bizarre. 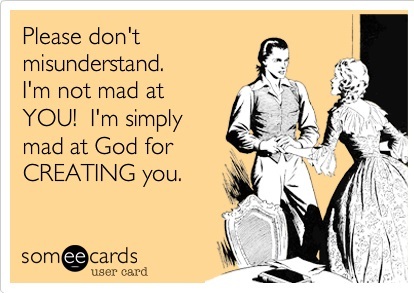 I am fairly certain you cannot reasonably be mad at God and also declare He doesn’t exist. Often the admonition to tell God off is couched in terms of being honest in the relationship. The theory involves not “stuffing” your feelings but letting someone…anyone and everyone know how you feel. In real life, the “letting it all hang out” approach only works in relationships you don’t want to keep. A “thanks-I-needed-that” slap in the face only yields positive results in the movies. In real life, heated explosions just create hard feelings and restraining orders. •	God is acting on waaaaay more information than I am. I have based my conclusions and responses on a microscopic part of what’s really going on. If I were “all knowing” like He is, I might have a leg to stand on. I have to remind myself that I am essentially clueless and He isn’t. •	God is acting out of love and concern for more than just me. He does love me but He also loves everyone else in the situation. My anger at God is generally patently Tim-centric. I feel angry when I get the crummy end of the stick but don’t feel the least bit offended when someone else gets it. In my personal sense of justice, somehow others deserve bad stuff and I don’t. •	His goodness infinitely exceeds mine. My indictment of the Lord often involves a comparison of my loving goodness to His perceived callousness. The argument includes at least one reference to how a good father is supposed to treat his children. Truth is: His good intentions toward me are defined by the cross. I have never come close to that kind of sacrificial goodness. Not even on my best day. I sincerely need to let go of any claim that I am the Lord’s role model for fatherly love. •	And finally, I have to remind myself of this simple truth: He’s God and I’m not. Often, our American egalitarian worldview fools us into thinking that everyone…including God…is on the same level. We believe that no one is better than anybody else; everybody has a vote; everybody has a choice; and everybody has a valid point to make. When I was working in Papua New Guinea I was surprised when a national friend told me that his people don’t buy our presumption that we can haul the Lord into court. He’s God. His status, power, wisdom, perspective, insight and authority trump ours. In my New Guinean friend’s worldview, everybody wasn’t as smart and as informed as everybody else or had equal right to an opinion. By virtue of Who He is…it is legitimately crazy for someone like me to put God on trial for negligence. But gee…it’s fortnight. Don’t waste it on being angry with God or anybody. Trust me: The emotional expenditure is not worth the return on the investment.